The minivan circled Chiang Mai like a vulture, swinging from hotel to hotel and picking up the listed passengers (most of them young Brits who couldn’t stop talking about how excited they were for tubing in Vang Vieng), the minibus began hurtling towards Chiang Rai on nice, smooth Thai roads. First stop at a roadside restaurant, where everybody ate a lunch of noodles, and where Neil was able to buy 10 more cans of Chang. First thing back on the bus, he cracked a fresh one. 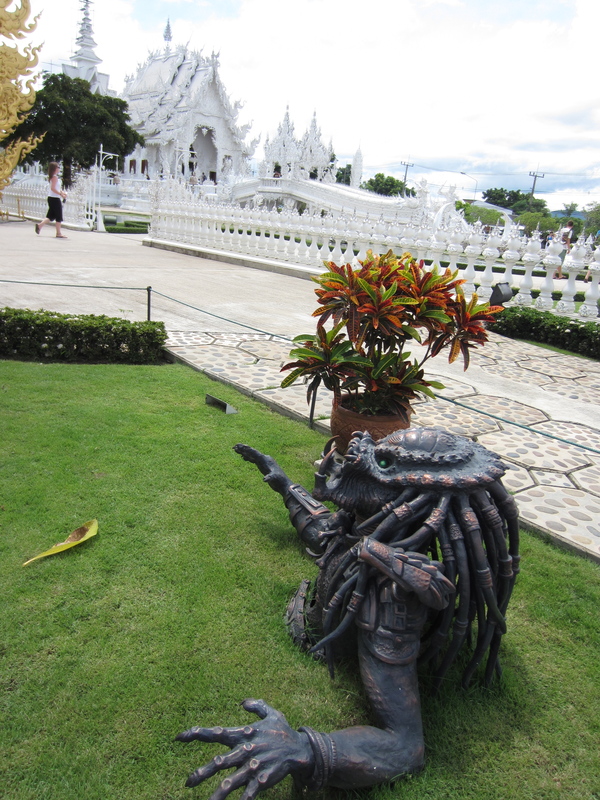 Wat Rong Khun was the next stop along the way. This temple was one to remember. The temple itself was white, all white, emblazoned with millions of tiny mirrors, glinting in the sun. 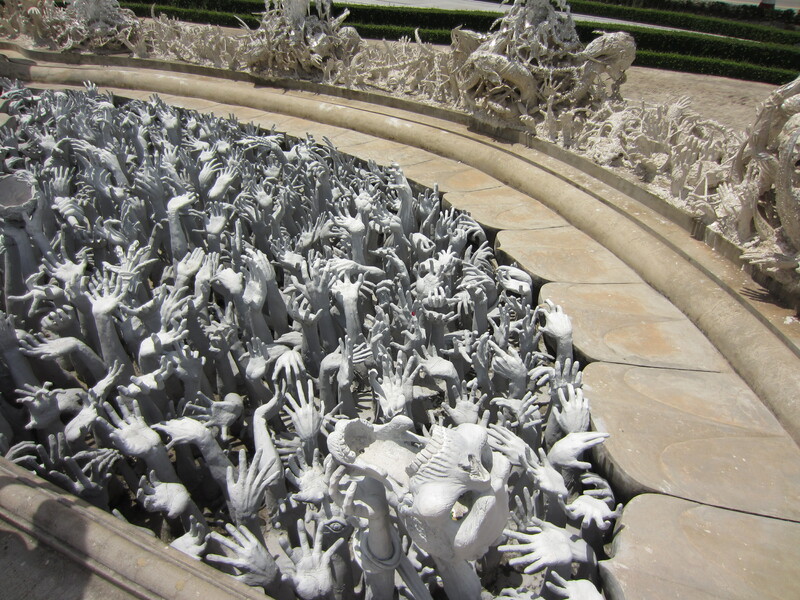 What was a little weird was the other stuff; a sea of human hand sculptures, raised and grasping like something from the ancient Greek underworld. 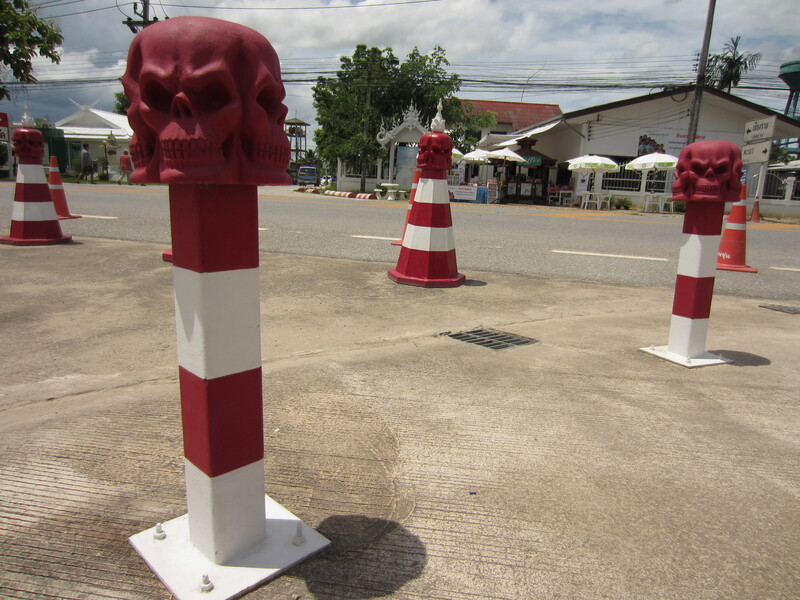 Near the entrance, a bronze Predator statue crawled from the ground, and traffic cones with angry red skulls spotted the parking lot. We walked away, perplexed by the decor. That night we slept in tiny Chiang Khong on the Thai border; the hotel was included in the slow boat package, complete with buffet of various vegetables and curries and rice. We relinquished our passports to the hotel, who would organise the whole boatload of people’s visas en masse the next morning. The town itself didn’t offer much except for our first glimpse of the Mekong, the last 7/11 we’d see for a while, and there, on the other side of the river, Laotian soil. We checked out early, and were handed our rations; a chicken sandwich for the long day that awaited us. The first vehicle of the day was a van that dropped us off at the riverfront. From there, small groups of us caught a little runaround boat that took us to the Laos side of the river to the town of Huay Xai. 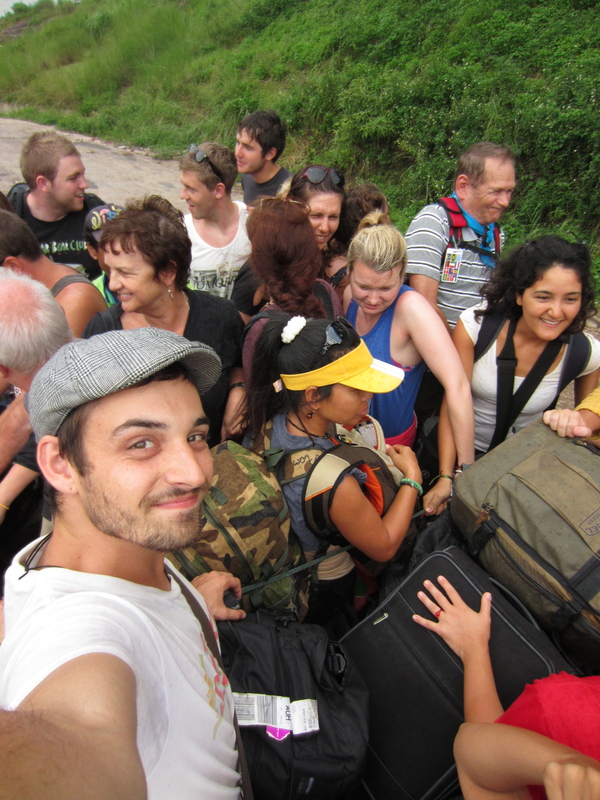 The border crossing was done within minutes. Neil the Northern Irishman, who had mysteriously vanished the previous night, turned up with a few big bottles of Beerlao and stories of visiting a few bars last night. From there, a truck took us to the slow boat. 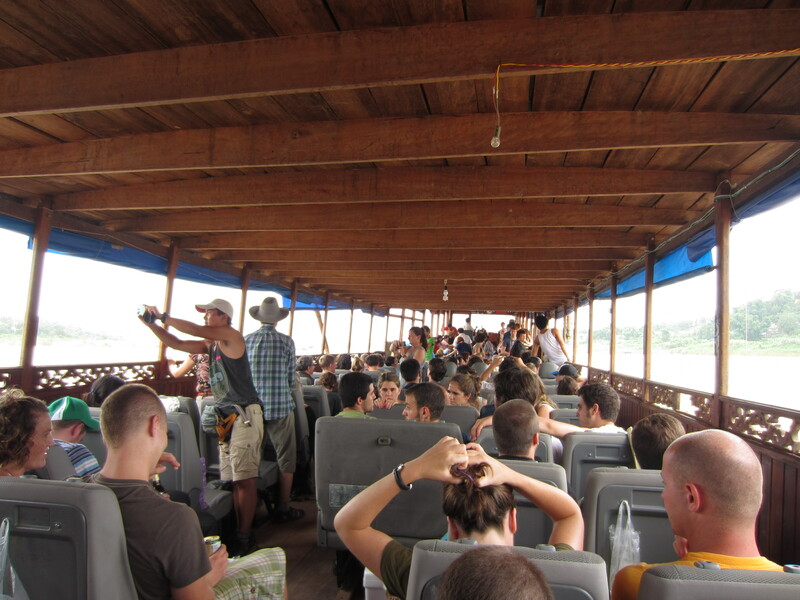 The slow boat was pretty cool; made of wood, very long and narrow. It was brightly painted, had a big engine room in the back, and a covered seating section made up the front and centre. We boarded and found ourselves a seat, car seats arranged in rows, but not bolted down, so they skated around on the floor. Padded seats. Nice. At the front was a little bar and snacks. The boat pushed off, and away we went, the great big engine in the rear coughing into life with a grumble and then a roar. 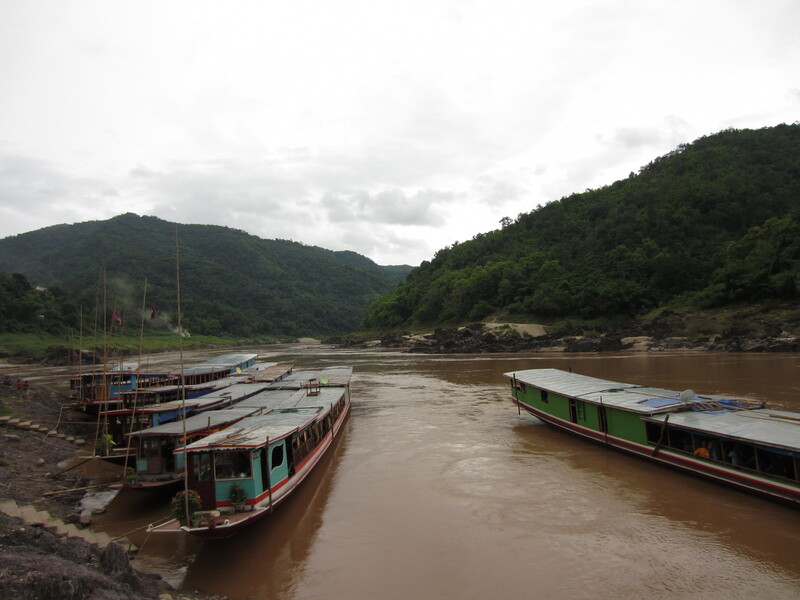 The boat’s engine thundered away behind us as we made our way down the Mekong’s caramel waters. The journey was underway as the bar opened and the Beerlaos started flowing. Low rolling hills, wispy clouds and curious fisherman accompanied us down the river. From time to time, we picked up a local from the riverbanks, and the polers got us moving again.Village life carried on as normal, as our boat of beer drinkers chugged slowly down the river. 7 hours later, the boat sauntered into the port of Pak Beng, the halfway point, and a hundred people stretched their legs and weary bones. Accomodation here was not included, so enterprising hotel owners sent trucks down to collect tourists and claim their business, hauling us back like sheep bound for market. This place was small and quiet, with a few restaurants to try. We made it an early night, as we needed our strength for the next day. And there were drug dealers prowling the streets of Pak Beng. We were told to meet at the dock for a 9am departure, although it seemed everybody else knew to come early. Arriving right on time, Cindy and I found ourselves at the back of the queue, and as a result, scored seats at the rear of the boat. At 10am the boat finally departed, and that great big workhorse of an engine kicked in again. This time, it was right behind our ears. We amused ourselves by chatting with Neil the Northern Irishman, who was introducing himself to every passenger. A few hours later, he was fast asleep, snoozing away in a hazy Beerlao drunk. Oh, the sound of that engine. 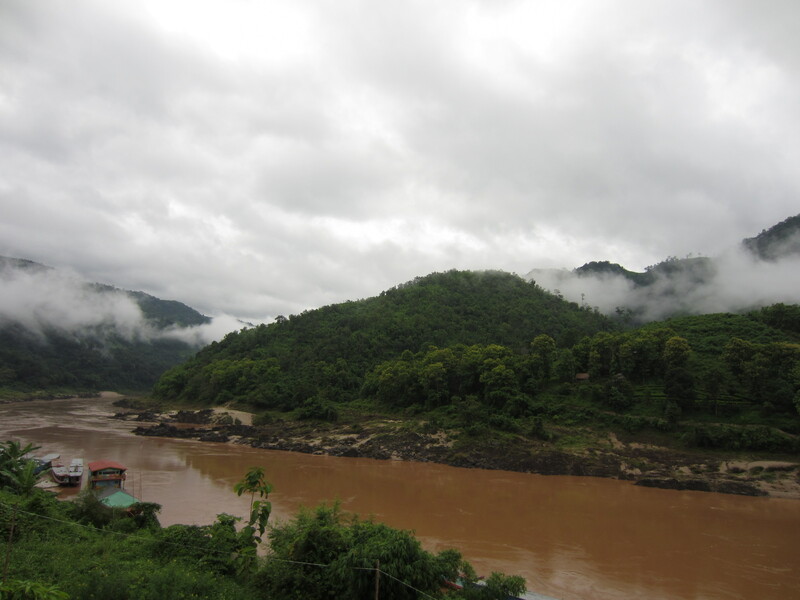 After 8 hours of the assault of being hit in the brain with an audio baseball bat, we arrived in Luang Prabang. The bags, which were stored under the floor near the engine compartment were unloaded. Disembarking took time. Passengers from the front squeezed to the back to retrieve their bags, whilst passengers from the back loaded up with their bags squeezed forward to disembark from the shifting gangplank. Cindy and I got off, exhausted, and began to search for a hotel. It was all worth it; we had arrived at Luang Prabang, which we soon discovered, was one hell of a cool city!